A savarin cake is an yeasted cake. Our host Felice Geoghegan , choose the theme "Bundts with yeast as the leavening agent". When I seen this theme was very happy since I, always wanted to make a savarin cake. I gave this a twist by making it with Jasmine tea. Thought that this cake will have a strong jasmine flavor, but, that was not so. 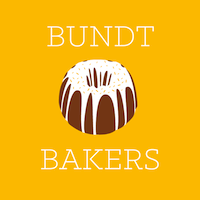 Joined the group of bundt bakers this month, thanks you friends for welcoming me into this group. This is my first post and enjoyed trying out this yeasted cake or else would not have ventured baking this cake. It's a must try cake and is excellent to serve as a dessert. Boil the milk, add the jasmine tea and let it rest covered till it comes to room temperature. In a large bowl ( I used the food processor) add the milk, yeast, sugar , eggs and essence, whisk for a minute or two. Then add the flour, a tablespoon at a time and whisk till all the flour is incorporated and forms a smooth batter. Then add the butter and continue whisking until it is all incorporated and you have a wet, glossy dough. Carry on beating for about two minutes. Cover the bowl with cling film. Leave to rise till it doubles. Left it in food processor bowl since I, did not want to waste any batter by pouring it into a another bowl. Oil an 8 inch savarin mould well and dust it flour , keep aside. When the cake dough doubles , stir the dough to knock out the air bubbles and spoon it into the mould. In the meantime preheat the oven to 200C. Leave the savarin in a draught-free spot to prove. When it has doubled in size, bake for 25 minutes until puffed, crisp, golden on the surface and as you can see it has left the sides of the mould. In the meantime while the savarin is baking let's prepare the syrup. Boil the jasmine tea and sugar, till it comes to a a rolling boil, then mix it well when the sugar dissolves take off flame. Then pass through a sieve and keep aside. When the savarin cools, then turn the out onto a shallow serving dish. Decorate with the assorted fresh fruit. Serve with crème fraîche, ice cream and assorted fresh fruits. See how light and spongy it is.. looks tempting na.. In the evening when my hubby went for his evening walk told him to get his favorite icecream. He bought a pack of butterscotch icecream. I served this as a dessert with butterscotch ice cream and assorted fresh fruit. This was a divine combination. I thought there were going to be many Savarins today Sneha, but evidently only you and I have great minds. Yours turned out gorgeous. Welcome to the #BundtBakers! Your first bundt with us is certainly a beautiful one, and I love the idea of using Jasmine tea in the syrup. I quite enjoy baking with tea. You made a beautiful cake - I just love all of that fresh fruit.